Lying to the north of South African borders are Namibia, Botswana, Zimbabwe and Mozambique. All of the countries are good 4×4 vehicle holiday routes, with one of my favourite places being “Victory Falls” on the border of Zambia and Zimbabwe. Called by the locals – Mosi-o-Tunya “The smoke that thunders”, for the reason that the falls rising to a height of 100+ meters from the river below and a length of over 1 kilometre can be seen from 40 kilometres away from the spray rising 400 meters into the air when in the river is in full flow. It is said to be the largest waterfall in the world, with 500,000,000 litres of water flowing in the rainy season between October and November months. It was David Livingston that named the falls after Queen Victoria, when discovered in 1855. 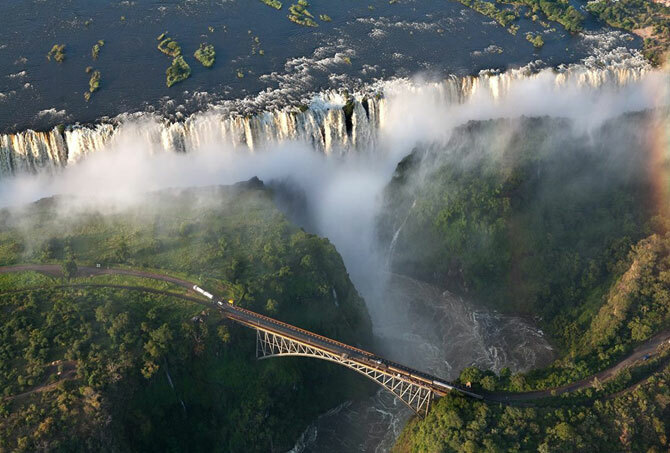 Victoria Falls is a UNESCO World Heritage Site, with both Zambia and Zimbabwe developing successful tourism on both sides of the falls that flow into the Zambezi River Gorge. The Falls can be viewed from many points. The Eastern Cataract and the Main Falls as well as the Boiling Pot, where the river turns and heads down the Batoka Gorge, are best visible from the Knife Edge. No matter where you view the falls, you can feel the power and sense of danger when standing and taking in this location. With numerous places to stay, (highly recommend checking out Trip advisor) and activities ranging from abseiling, bungee jumping, gorge swing, kayaking and whitewater rafting to horseback trails, hikes and walks. There is no shortage of things to do in this playground known as the “Adventure Centre” of Southern Africa. It really is an area that you can spend 10day to 3 weeks exploring. You can fly, drive or travel by train from South Africa. To wet your appetite this video by Redbull TV on “The smoke that thunders” has two world class divers preparing for the most challenging dive from the top of Victoria falls. Enjoy!